Announcement time! 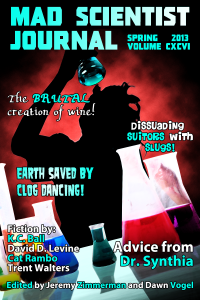 The latest anthology of Mad Scientist Journal is now available for download at Smashwords and Amazon. This edition is particularly exciting for me as it includes my story Mabel's Mission--along with number of other great stories including some exclusive fiction not previously published on the MSJ website. If you like a fun read from the slightly-weird side of the sci fi world (or if you just want to support me as a writer ;) ) check it out.